Reinvesting: GSM Acquires New Machine to Serve its Customers Better. The Ocean Clipper CNC Angle Line produces perfectly accurate clip angles. It is an ideal machine for fabricators that need to punch holes in angle and shear it to the length. This new equipment addition brings with it many benefits and features that will help us serve our customers more efficiently. The Ocean Clipper is the world’s most compact angle line. Its unique patented design allows for a dramatically more compact machine. Traditionally all angle lines feature punches that cannot be in-line with one another, thus, requiring a much larger machine to work with. The Ocean Clipper allows for a drill and a punch in-line with each other, reducing the drop to 8″ (250mm) and requiring a much smaller piece of equipment. This compact design allows us to be more efficient with our space at GSM Industrial. Small and mighty! Don’t let the size of the Ocean Clipper fool you. 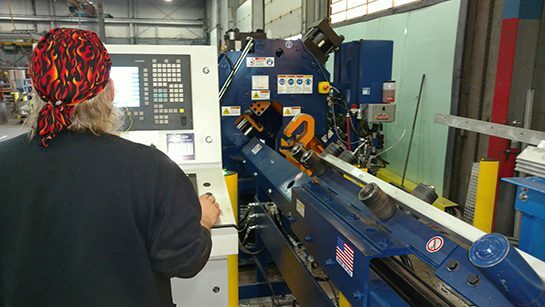 It’s designed to handle heavy duty work in some of the toughest fabricating shops in the world. 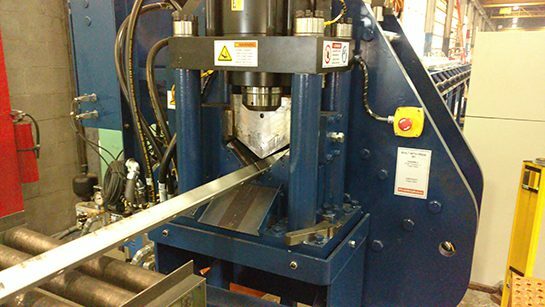 Its drill spindle is virtually bulletproof and can drill through 10″ of steel. 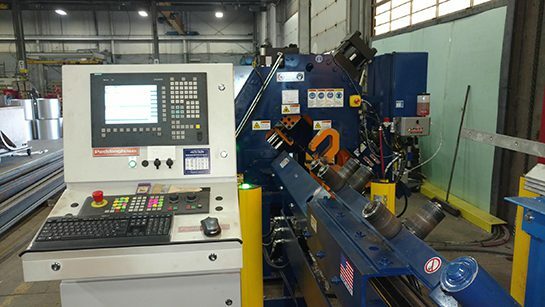 Its 75-ton Hydraulic Punch has a punching cycle of 2 seconds, making this machine powerful and fast! With power like this GSM Industrial is able to take on even tougher jobs with clear precision. Purchasing new equipment can often disrupt workflow, but with the Ocean Clipper’s seamless software integration, there is virtually no downtime during the changeover. The programming process is both simple and intuitive allowing your average operator to program with ease. This no-hassle process keeps GSM Industrial running smoothly while adding a new addition to our machinery lineup. Elimination of manual layout and manual punching of clip angles. Watch the Ocean Clipper CNC Angle Line in action here. We hope you are as excited about this new machinery addition as we are. Give us a call at 717-207-8985, or contact us today to get your next project started.